Augustus I, elector of Saxony, was the younger son of Henry, Duke of Saxony, and consequently belonged to the Albertine branch of the Wettin family. Born at Freiberg on the 31st of July 1526, and brought up as a Lutheran, he received a good education and studied at the University of Leipzig. When Duke Henry died in 1541 he decreed that his lands should be divided equally between his two sons, but as his bequest was contrary to law, it was not carried out, and the dukedom passed almost intact to his elder son, Maurice. Augustus, however, remained on friendly terms with his brother, and to further his policy spent some time at the court of the German king, Ferdinand I, in Vienna. In 1544 Maurice secured the appointment of his brother as administrator of the bishopric of Merseburg; but Augustus was very extravagant and was soon compelled to return to the Saxon court at Dresden. Augustus supported his brother during the war of the league of Schmalkalden, and in the policy which culminated in the transfer of the Saxon electorate from John Frederick I, the head of the Ernestine branch of the Wettin family, to Maurice. On the 7th of October 1548 Augustus was married at Torgau to Anna, daughter of Christian III, king of Denmark, and took up his residence at Weissenfels. But he soon desired a more imposing establishment. The result was that Maurice made more generous provision for his brother, who acted as regent of Saxony in 1552 during the absence of the elector. Augustus was on a visit to Denmark when by Maurice's death in July 1553 he became elector of Saxony. The first care of the new elector was to come to terms with John Frederick, and to strengthen his own hold upon the electoral position. This object was secured by a treaty made at Naumburg in February 1554, when, in return for the grant of Altenburg and other lands, John Frederick recognized Augustus as elector of Saxony. The elector, however, was continually haunted by the fear that the Ernestines would attempt to deprive him of the coveted dignity, and his policy both in Saxony and in Germany was coloured by this fear. In imperial politics Augustus acted upon two main principles: to cultivate the friendship of the Habsburgs, and to maintain peace between the contending religious parties. To this policy may be traced his share in bringing about the religious peace of Augsburg in 1555, his tortuous conduct at the diet of Augsburg eleven years later, and his reluctance to break entirely with the Calvinists. On one occasion only did he waver in his allegiance to the Habsburgs. In 1568 a marriage was arranged between John Casimir, son of the elector palatine, Frederick III, and Elizabeth, a daughter of Augustus, and for a time it seemed possible that the Saxon elector would support his son-in-law in his attempts to aid the revolting inhabitants of the Netherlands. Augustus also entered into communication with the Huguenots; but his aversion to foreign complications prevailed, and the incipient friendship with the elector palatine soon gave way to serious dislike. 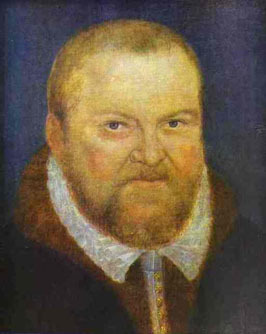 Although a sturdy Lutheran the elector hoped at one time to unite the Protestants, on whom he continually urged the necessity of giving no cause of offense to their opponents, and he favored the movement to get rid of the clause in the peace of Augsburg concerning ecclesiastical reservation, which was offensive to many Protestants. His moderation, however, prevented him from joining those who were prepared to take strong measures to attain this end, and he refused to jeopardize the concessions already won. The hostility between the Albertines and the Ernestines gave serious trouble to Augustus. A preacher named Matthias Flacius held an influential position in ducal Saxony, and taught a form of Lutheranism different from that taught in electoral Saxony. This breach was widened when Flacius began to make personal attacks on Augustus, to prophesy his speedy downfall, and to incite Duke John Frederick to make an effort to recover his rightful position. Associated with Flacius was a knight, William of Grumbach, who, not satisfied with words only, made inroads into electoral Saxony and sought the aid of foreign powers in his plan to depose Augustus. After some delay Grumbach and his protector, John Frederick, were placed under the imperial ban, and Augustus was entrusted with its execution. His campaign in 1567 was short and successful. John Frederick surrendered, and passed his time in prison until his death in 1595; Grumbach was taken and executed; and the position of the elector was made quite secure. The form of Lutheranism taught in electoral Saxony was that of Philipp Melanchthon, and many of its teachers and adherents, who were afterwards called Crypto-Calvinists, were favored by the elector. When Augustus, freed from the fear of an attack by the Ernestines, became gradually estranged from the elector palatine and the Calvinists, he seemed to have looked with suspicion upon the Crypto-Calvinists, who did not preach the pure doctrines of Martin Luther. Spurred on by his wife the matter reached a climax in 1574, when letters were discovered, which, while revealing a hope to bring over Augustus to Calvinism, cast some aspersions upon the elector and his wife. Augustus ordered the leaders of the Crypto-Calvinists to be seized, and they were tortured and imprisoned. A strict form of Lutheranism was declared binding upon all the inhabitants of Saxony, and many persons were banished from the country. In 1576 he made a serious but unsuccessful attempt to unite the Protestants upon the basis of some articles drawn up at Torgau, which inculcated a strict form of Lutheranism. The change in Saxony, however, made no difference to the attitude of Augustus on imperial questions. In 1576 he opposed the proposal of the Protestant princes to make a grant for the Turkish War conditional upon the abolition of the clause concerning ecclesiastical reservation, and he continued to support the Habsburgs. Much of the elector's time was devoted to extending his territories. In 1573 he became guardian to the two sons of John William, duke of Saxe-Weimar, and in this capacity was able to add part of the county of Henneberg to electoral Saxony. His command of money enabled him to take advantage of the poverty of his neighbors, and in this way he secured Vogtland and the county of Mansfeld. In 1555 he had appointed one of his nominees to the bishopric of Meissen, in 1561 he had secured the election of his son Alexander as bishop of Merseburg, and three years later as bishop of Naumburg; and when this prince died in 1565 these bishoprics came under the direct rule of Augustus. As a ruler of Saxony Augustus was economical and enlightened. He favored trade by encouraging Flemish emigrants to settle in the country, by improving the roads, regulating the coinage and establishing the first posts. He was specially interested in benefiting agriculture, and added several fine buildings to the city of Dresden. His laws were numerous and comprehensive. The constitution of 1572 was his work, and by these laws the church, the universities and the police were regulated, the administration of justice was improved, and the raising of taxes placed upon a better footing. In October 1585 the electress Anna died, and a few weeks later Augustus married Agnes Hedwig, a daughter of Joachim Ernest, prince of Anhalt. His own death took place at Dresden on the 21st of January 1586, and he was buried at Freiberg. By his first wife he had fifteen children, but only four of these survived him, among whom was his successor, the elector Christian I (1560-1591). Augustus was a covetous, cruel and superstitious man, but these qualities were redeemed by his political caution and his wise methods of government. He wrote a small work on agriculture entitled K�nstlich Obstund Gartenb�chlein.